8 Is it okay if we unprotect this? 13 everyone i think we should Protection Ash's Chimchar page again for DP116! 23 Why can't I redirect? 43 Important . . . . ? Given that the Gliscor is on the far right end of what we see in the group shot, and given the Gliscor's distance from Ash, it's not a foregone conclusion that it's Ash's. For all we know, Paul could be in the movie and that's his Gliscor. Or given how Shaymin has a role in the movie, that the movie might be Marley's anime appearance and that's her Gliscor. Or it could belong to a character of the day not covered in the group shot. I am 99% sure that that is the "World of Pokémon" group shot, which isn't your standard disposable shot. There is not much reason to give it to us to begin with and they would definately make sure the team lineup would be finalised before doing so, especially given what we do get. Is it okay if we unprotect this? I found this image on Serebii. 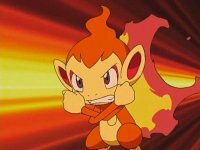 everyone i think we should Protection Ash's Chimchar page again for DP116! We can put one here until they decide to edit it in. Flame Wheel When Pokémon Worlds Collide! Scratch When Pokémon Worlds Collide! Ember When Pokémon Worlds Collide! An x shows that the move cannot be legitimately learned by this Pokémon in the games. Moves used recently are in bold unless all moves all fit this case. Plus, it learns Mach Punch! Hey admins, as you guys know that this article has been protected so can you please fix these things. Firstly, change " As a Chimchar and Monferno, its Japanese voice actress is 林原めぐみ Megumi Hayashibara, and its English voice actor is Bill Rogers " because infernape's voice actor has been confirmed now. I've tried inserting the following picture of Infernape using Flamethrower into the move template but for some reason it won't show after saving. Can someone put it in for me please? "Infernape also used it's ability more than any other Pokémon Ash owned, using it three times; in Chim-Charred!, DP163 and DP179. Buizel is the only other Pokémon to use it's ability more than once; in A Triple Fighting Chance! and in Short and To the Punch!. " Important . . . . ? This page was last edited on 13 September 2015, at 19:04.